When living in Florida, all cooks must learn how to cook okra. This vegetable, especially deep fried is a staple in many homes. It is also available in many restaurants. 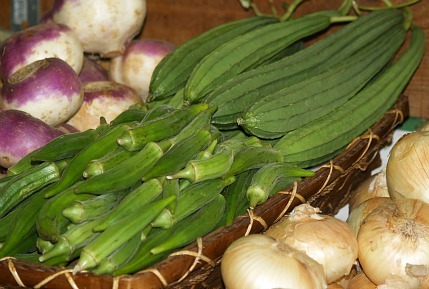 Okra can be purchased fresh, frozen canned or pickled. 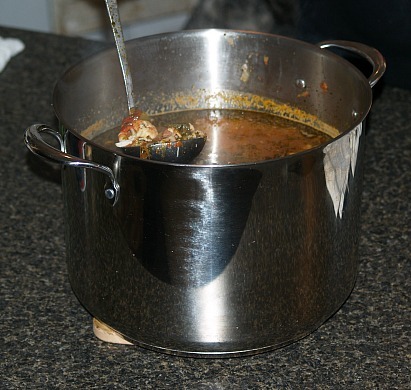 It is added to stews and soups or is served as a side dish to many meals. 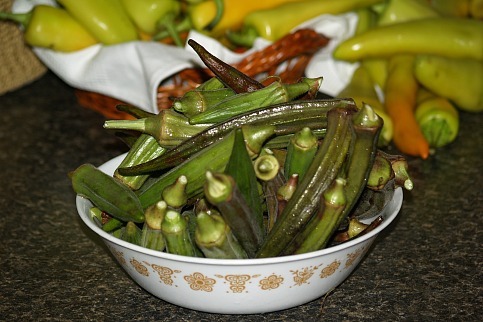 Fresh okra is available throughout the Southern United States year round. To be a true southerner, you must know how to cook okra. It was hard for me to get used to because most cooked okra is too “slimy” for me. I quickly learned how to love fried okra because everywhere you go to eat has fried okra on the menu. It is usually very crispy and well flavored. 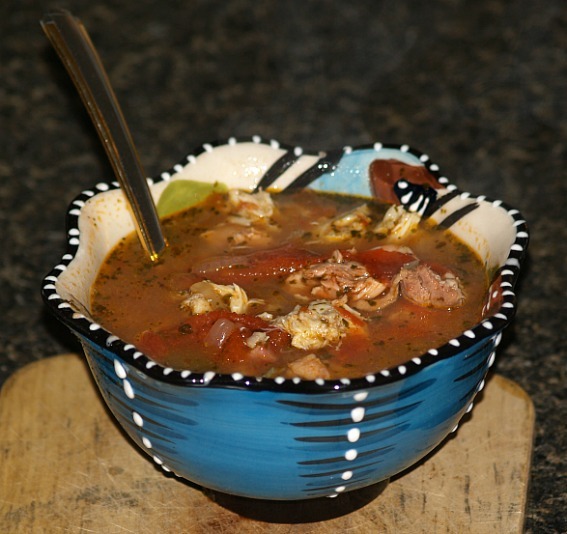 My other favorite recipe for okra is in the following seafood gumbo recipe. Gumbo is not the same without okra! Recently I was asked if I wanted to learn how to cook okra and to use a different variety of okra. I had never seen this type before. It is much larger and I was told to slice it crosswise in about ¼ inch slices. My friend explained that this type is never slimy and that the people who do not like the typical slimy type of okra loves this kind. I went home and could not wait to learn how to cook okra using this new kind which I purchased. I was anxious to get started so I washed it up and then sliced it. After pouring oil in my heavy Dutch oven to heat, I mixed an egg with some buttermilk for the dipping and then I seasoned some cornmeal with salt and pepper. 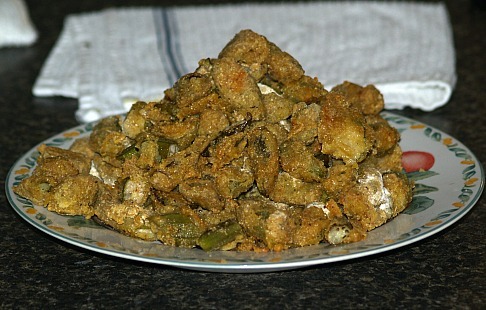 When the oil was hot I dipped the okra slices in the buttermilk and then in the cornmeal. I already knew how to cook okra in hot oil until golden brown on both sides so this is what I did with these slices. My friend was right; great flavor and no sliminess at all. I love my new discovery! From now on this is the only kind that I will use. Wash okra, cut off stems and cut into ¼ inch slices. Dip into egg and roll into cornmeal and fry in hot oil until brown. Drain on paper towels. I recently discovered a delicious way to fix okra in the oven. It does not have the fat, like fried okra but I think the taste is even better. Someone described it to me “as eating popcorn” and I agree. I like it even when it is cold. Wash and rain okra thoroughly; slice it in 1 inch pieces and place in a bowl. Pour buttermilk over the okra pieces. Dip the buttermilk covered okra pieces in the dry mixture and place on an oiled baking sheet. Place tray in the oven at 350F degrees; bake about 20 minutes or until bottoms brown. Turn okra over with a spatula and return to oven until other side has browned about 20 minutes longer. Simmer okra and tomatoes together for about 5 minutes. Add butter, salt and pepper. Wash okra, cut off stems and slice and place in saucepan. Add salt, cover with water and simmer for about 15 minutes uncovered. To serve, season with salt, butter and a little vinegar. Heat bacon drippings in a large pot. 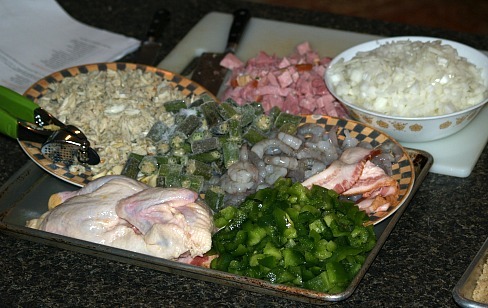 Cut ham, chicken, onions and bell pepper into small pieces and put into hot bacon drippings. Add the okra and chopped parsley and fry until brown. Add the boiling water, tomatoes, garlic, bay leaves, thyme, salt, pepper and red pepper flakes; Bring to a boil and simmer for 1 hour. Add the shrimp and crabmeat and cook 30 minutes longer. Add the seafood seasoning and stir to blend; add more salt and pepper if needed. NOTE: The flavor in this is better if refrigerated overnight and reheated.